All applicants must apply through the applicant portal. 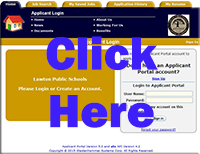 Available jobs can be viewed through the Applicant Portal without having to submit an application. Just click Job Search. If you want to submit an application you have to Sign Up first (create an account) then put in your application. If you have the qualifications, apply for the position you are considering.